Everything we do as a company is rooted in our Prudent Practices®. Officially published in 2003, the Prudent Practices comprise a step-by-step process that ensures an investment strategy is being properly developed, implemented and monitored according to both legal and ethical obligations. Each practice has been substantiated by applicable legislation, regulation and/or case law to ensure compliance. Full citations, as well as detailed criteria, narrative discussion, practical application and suggested procedures can be found in the Prudent Practices handbooks. 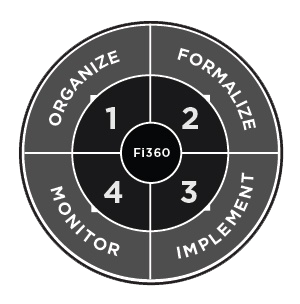 Fi360 defines an investment fiduciary as someone who is providing investment advice or managing the assets of another person and stands in a special relationship of trust, confidence and/or legal responsibility. An Investment Steward is a person who has the legal responsibility for managing investment decisions, including plan sponsors, trustees and investment committee members. An Investment Advisor is a professional who is responsible for providing investment advice and/or managing investment decisions. Investment Advisors include wealth managers, financial advisors, trust officers, financial consultants, investment consultants, financial planners and fiduciary advisers. An Investment Manager is a professional who has discretion to select specific securities for separate accounts, mutual and exchange-traded funds, commingled trusts and unit trusts. Check out What We Do to learn all the ways we enable fiduciaries to implement a prudent process!